← Online Dating Horror Story #7: You Live WHERE? For a truly unique fitness experience, try an aerial yoga class — stretching and posing using long fabric slings suspended from the ceiling as supports. To do that, you choose a silk that’s just the right height to sit on; the fabric has some give, so you stretch it just under your rear end and take a seat. You lie back, extend the fabric toward your feet, then lift your bottom and scootch back a few times. Pretty soon you’re horizontally suspended midair in a colorful, lightweight cloud — and the rest of the world is blocked out. It’s a sensation unlike anything else you’ve ever experienced — because you’re not lying on water, or a bed or the ground. Yet, you don’t feel afraid because the hammocks are built to hold 2,000 lbs. and the connecting apparatus between it and the 25-foot ceilings is built to even higher specifications. And the restful, New Age music in the background is calming. During the hour-long class, we ran through a smooth routine, sometimes folding the silks in half and sometimes folding them in quarters to do the various moves. 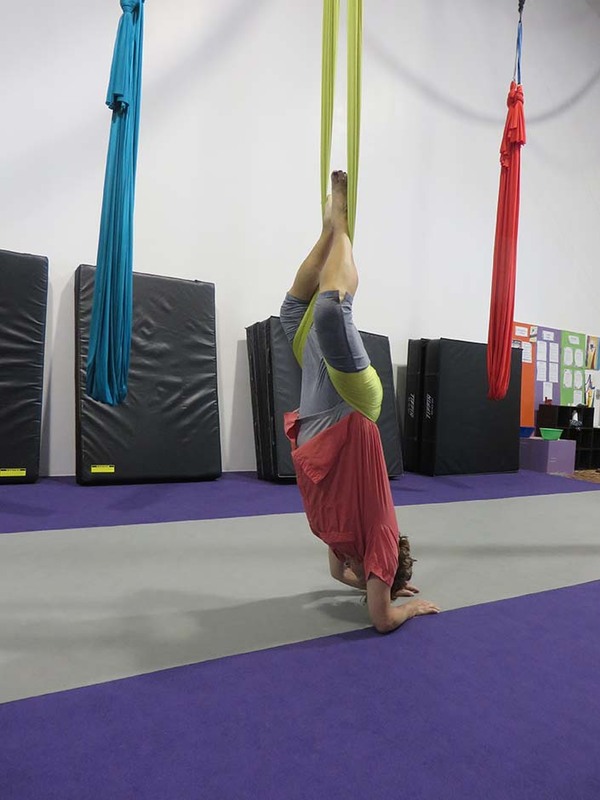 We sat on our haunches on the floor for some of the poses, inserting our necks, arms, and legs at various points into the hammock, pulling slightly and holding the poses to feel a stretch. We also got on the ground in a push-up position with our feet suspended in the silks and did some plank-like “stomach crunch”moves. 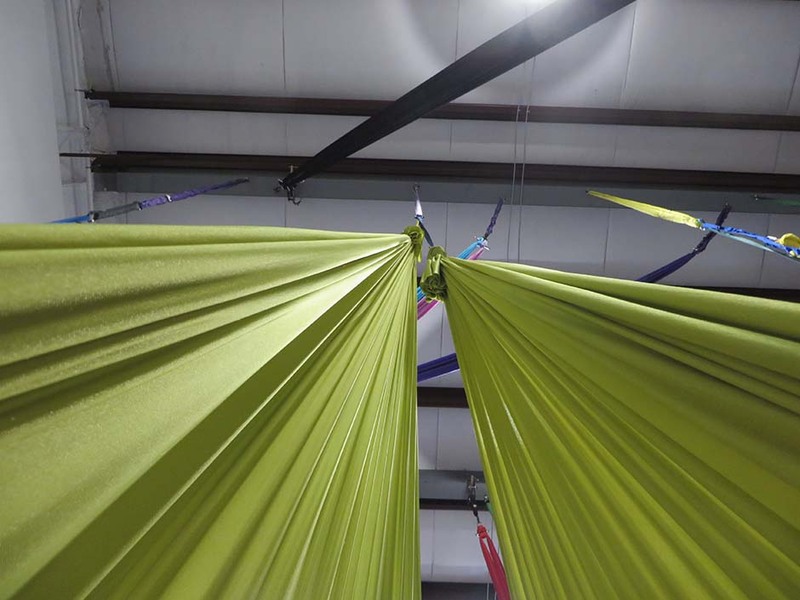 Although the plank move (above) was pretty dramatic, the most exotic pose we did was to sit in the hammock “chair” with the fabric mid-way up our back, spread our legs apart, lean back, then twist and wrap our legs in the air above our heads around the columns of silks. We then slowly lowered our heads and necks backwards toward the (well-padded) floor. Once there, using our forearms, we “walked” a short distance and held the position. It resulted in an amazing stretch — that you can’t believe you’re actually doing! Seems like you’re defying gravity! And it wasn’t hard at all; you just listen to the instructor and follow her step-by-step directions. 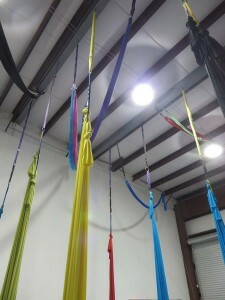 At the end of the class — which went by very fast — we got back into the silks and laid there for five minutes, stretching full-length and concentrating on our breathing. It was so relaxing that I didn’t want to leave! 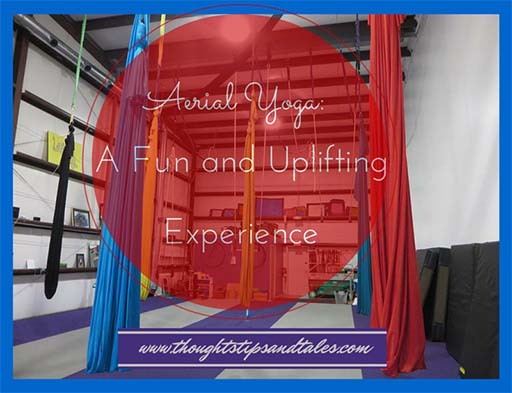 This entry was posted in aerial yoga, exercise, fitness, unusual exercise classes, yoga and tagged aerial fitness, aerial yoga, exercise, fitness, unusual exercise classes, yoga. Bookmark the permalink.